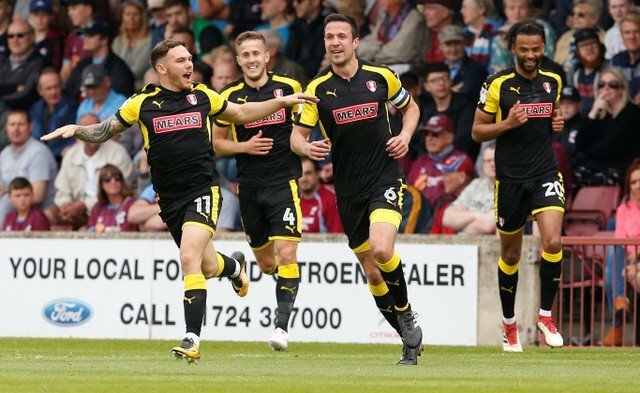 Rotherham United twice came from behind in the early afternoon kick-off against neighbours Sheffield United at the New York Stadium today to end up with a well deserved point. A minutes applause was held before the game for former Rotherham United ‘keeper Gordon Morritt who sadly passed away this week. The Millers could probably have been in front as early as the first minute when some super work from Jon Taylor down the wing saw him get a cross in towards Richie Towell but Sheffield United’s ‘keeper Dean Henderson got down well to the shot. Just two minutes later Ryan Williams found Taylor who in turn got the ball to Ryan Manning with the QPR loanee finding Will Vaulks only for the skipper for the day to send the ball nearer the corner than the net. A couple of Vaulks’ long throws had the visitors nervous with one finding Taylor at the far post who saw his header go just over the crossbar. After all the pressure from the hosts it was a bit of a disappointment when Sheffield United’s first foray up front of note ended in a goal on eight minutes. A short pass when it should have been long from Semi Ajayi saw Mark Duffy get the ball, step by Clark Robertson and fire past the advancing form of Millers’ ‘keeper Marek Rodak. With twenty-five minutes on the clock Rotherham had another chance after a Michael Smith knock-down to Williams saw the Australian get the ball to Richie Towell whose strike on goal was blocked by the Blades’ defence. Smith himself got away from his marker ten minutes later and gets to a ball before Henderson but a yellow shirt was there to clear with Henderson making up for his error minutes later when he did well to save from an Ajayi header. Taylor was the next to be foiled by the visiting goalkeeper when he had a shot superbly turned round the post. At the other end Vaulks did well to clear a David McGoldrick strike off the line and to safety. With the half coming to an end Williams got free only to see his shot go inches wide followed by a Vaulks shot being blocked and a Towell solo run ending in his shot going wide. In the opening minutes of the second half Jon Taylor won a free-kick which he took himself but put over the crossbar before a Zak Vyner cross found Will Vaulks but he was adjudged to have fouled Dean Henderson in the area. After a couple of corners for the visitors coming to nothing some good work from striker Michael Smith saw him send Taylor on his way who in turn found Ryan Manning but his cross was cleared. On the hour mark some good forward play from Sheffield United saw a header from David McGoldrick set up Oliver Norwood whose shot hit the leg of a Rotherham defender and went for a corner which Smith easily cleared. Probably Marek Rodak’s first save of the afternoon came minutes after that when he did well to get down to a hard shot from Mark Duffy, who, possibly for the first time of the afternoon, managed to stay on his feet. A poor challenge on Manning earned Chris Basham the first yellow of the afternoon which was followed by the first subs with McGoldrick making way for Leon Clark and Joe Newell coming on for the Millers to replace Manning. Two minutes later Newell won his side a corner which he took and the head of Semi Ajayi sent it on his way into the box before it finally fell to Clark Robertson who saw his shot well saved by Henderson before being scrambled away to safety. But the promising goal finally came for the hosts on sixty-six minutes when a cross from Vyner found Taylor who took the chance to shoot with the ball taking a slight deflection into the net to give the Millers a well deserved equaliser. And it could have been more a minute later but for Kieron Freeman being on his toes and Henderson taking a Taylor shot into his arms. It was an open, end-to-end game with both sides seeing shots go wide until five minutes from time when a shot from Billy Sharp found Chris Basham at the back post who headed home in front of the travelling two thousand six hundred fans. Not to be outdone the Millers fans raised their voices and urged the team in red and white to up their game. The Blades brought on Richard Stearman to replace Duffy while the Millers replaced Vyner and Williams with forwards Kyle Vassell and Jamie Proctor and just before the ninety minute mark Sheffield United sent on Marvin Johnson for Sharp. Time wasting by the visitors and injuries saw the Fourth Official put five minutes up on the board and two of those had just gone when a cross from Smith fell to substitute Proctor who smashed the ball into the back of the net from the edge of the box sending nine thousand Millers fans up into the air to celebrate. What a good derby this was. Both sides having shots, both playing well and both getting a point. Should it have been more for the Millers? Perhaps it should but I think most of us would have taken a draw at the start of play.